This recipe comes from The Next Food Network Star and was featured in the Bon Appétit magazine. 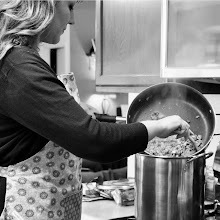 I tried it out for a Sunday dinner and EVERYBODY raved over it. My sister even sent me a text later in the evening thanking me for the awesome dinner and said she was going to have fanciful dreams about it all night. She especially loved the vegetables. (WOW.) When I made it I served it with a simple grilled teriyaki chicken and jasmine rice. Unfortunately I didn't take a photo after it was baked, but you get the idea. It's a yummy recipe! There were no leftovers. Whisk vinegar and mustard in medium bowl. Gradually whisk in oil. Stir in garlic, thyme, and basil. Season to taste with salt and pepper. Preheat oven to 450°F. 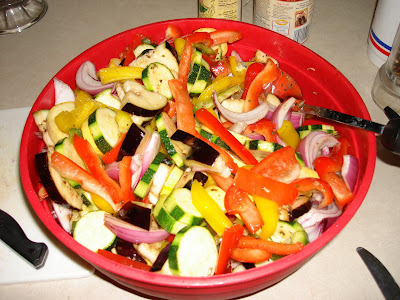 Toss all vegetables in large bowl; sprinkle with salt and pepper. Add dressing; toss to coat. Divide between 2 large rimmed baking sheets. 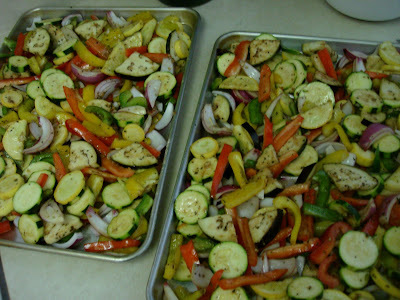 Roast until vegetables are tender and slightly brown around edges, about 35 minutes.